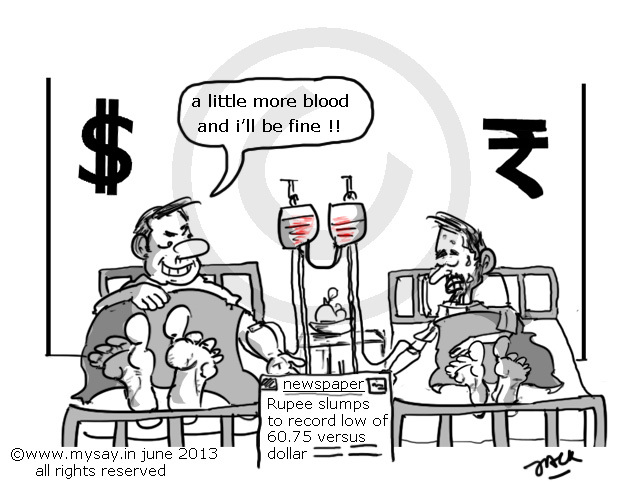 Rupee(INR) on Tuesday slumped to record low of 60.75 versus dollar. even i used to run a call center some years back in 2008 but back then rupee had gone strong .. and exchange rate was about Rs36 per USD and now that I do not have any scene of making money in USD .. anymore ..
he he he 🙂 I loved the way you showed even the feet of the man on the left to be so plump!! thanks dear friend 🙂 I am glad you notice the details I work on 🙂 feels good ! brain-drain guys must be overjoyed now. thanks for dropping by and sharing thoughts bro ! This post has elevated your blog way above any other doodle blog on-line. I again reiterate, what I have said many times over in different ways, you and your doodles represent the perceptions of contemporary intelligentsia of the sub-continent. Jeetey rahiye!!! I’m not happy with this, while mostly persons are happy with this who do work for US clients or for $ currency. personal pockets are bigger than country for many .. hence the country is in a bad state .. and distribution of wealth is uneven !! who will explain but ? Oh my God, you are now scaring me even more..MILITARY RULE, oh No!